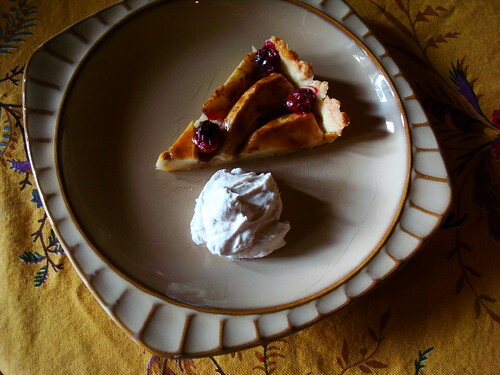 Daring Bakers’ Challenge: Crostata! | bake me away! The 2010 November Daring Bakers’ challenge was hosted by Simona of briciole. She chose to challenge Daring Bakers to make pasta frolla for a crostata. She used her own experience as a source, as well as information from Pellegrino Artusi’s Science in the Kitchen and the Art of Eating Well. I used version 1 of the pasta frolla recipe, which can be found here. 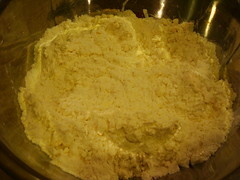 Rub or cut the butter into the flour until the mixture has the consistency of coarse crumbs. I used a pastry cutter for this! 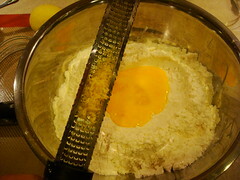 Make a well in the center of the dry ingredients, then pour the eggs in the center. 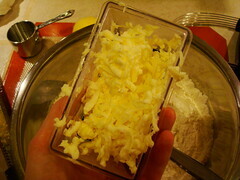 Add the lemon zest and mix with a fork, then your fingertips. Knead the dough lightly until it forms a ball. Wrap in plastic wrap, then refrigerate for at least 2 hours or up to 3 days. After chilling, unwrap the dough. Lightly sprinkle flour over the top and roll out over the plastic wrap. Using the plastic wrap, flip the dough over the tart pan. 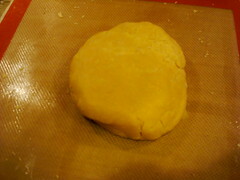 Trim the overhang and press the dough into the sides evenly. 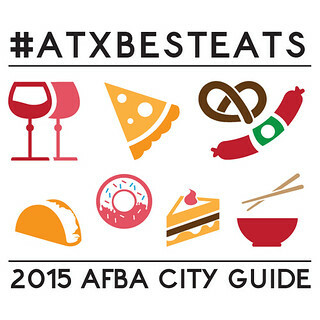 We were free to choose whatever we wanted to fill our crostate with, even savory ingredients! I decided I would make mine for Thanksgiving (to go along with the pumpkin cream pie), and that apples and cranberries would be perfect. Caramel makes everything better! Note: I used a mix of Golden Delicious and Granny Smith apples, but only used about 2/3 of the apple mixture. I think this is because I sliced my apples thinner than the recipe called for. 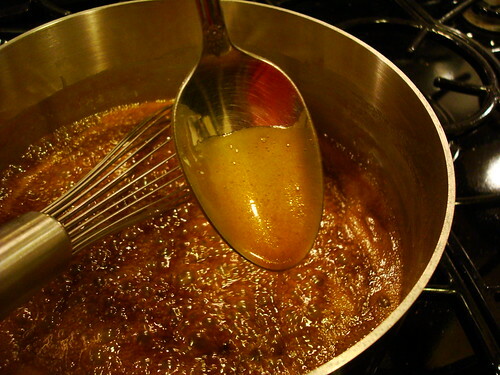 Caramel: In a medium saucepan, bring the sugar, cream, and butter to a boil over medium-high heat, whisking constantly until the sugar dissolves. Boil for about 10 minutes whisking frequently until the mixture coats a spoon. This will keep for 5 days in the refrigerator. 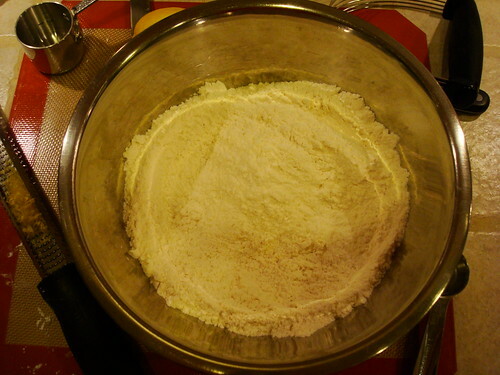 Filling: In a large bowl, mix together the sugar, flour, cinnamon, and cardamom. 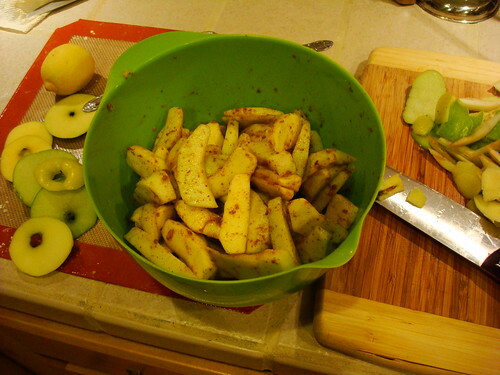 Add the apples and toss until they are evenly coated in the dry ingredients. Assembly: Heat the oven to 375F. Remove the pasta frolla from the fridge. Unwrap it, lightly flour the top and roll it out on top of the plastic wrap. Keeping it on the plastic, flip the dough into the tart pan. 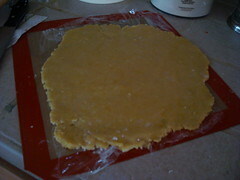 Peel off the plastic, trim off the excess dough, then press the dough into the sides of the pan into a uniform thickness. Prick the bottom of the dough with a fork in several places. Arrange the apple slices snugly in a circle around the edge of the pan. Repeat for the inner circle, then place cranberries around the border of each. Brush the border and strips of dough with the reserved beaten eggs. 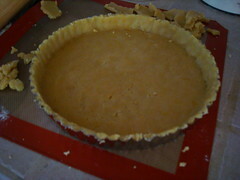 Bake the tart for 25 minutes, check on it, then continue baking until the tart is of a nice golden hue. When done, remove the tart from the oven and let cool. If you have used a tart pan with a removable bottom, then release the tart base from the fluted tart ring. Make sure the tart is completely cool before slicing and serving. Before serving, heat some of the caramel in a liquid measuring cup. 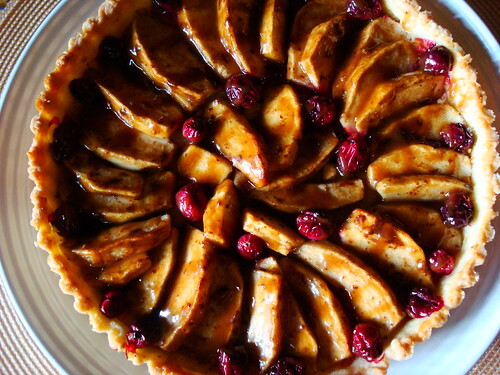 Brush the caramel over the apples and cranberries to coat them, then drizzle caramel over the whole tart. Let people add more caramel to their slices, if desired. I served this with some spiced whipped cream: beat 1 cup heavy cream, 2 teaspoons maple syrup, 1/2 teaspoon cinnamon, and 1/4 teaspoon cardamom until soft peaks form. This was a very delicious crostata! In fact, it didn’t even get to see the sun set. 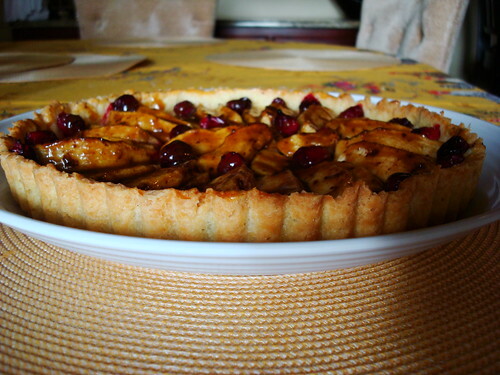 ;) The sweetness of the caramel and tartness of the cranberries were a nice balance, and who doesn’t love baked apples? The pasta frolla was very bright with the lemon zest, and I would definitely make it again. I had only made pie dough once several years ago, so this was a good challenge for me. The edges were more crisp than flaky, so I think I may have overworked the dough a little. Guess I should make some more crostate…darn! Can’t wait to find out about next month’s challenge! This sounds delicious – caramel apple, when the caramel has that much butter and sugar in it, has win written all over it. And this is my first month in Daring Bakers, too. Are you pumped for the 12/1 reveal? Welcome to the Daring Bakers! Your crostata looks and sounds amazing, but then I’m a sucker for anything with cardamom in it. Love it! This looks so wonderful. I’m notorious for over-working dough :( I finally got pie crust down to a science, but I’m still not even close with my biscuits! I can testify that is the yummiest dessert eveh!! And the caramel sauce…OMG!!! I was hovering over Jess telling her to keep adding more caramel while taking swipes with my finger in the bowl. I’m still thinking about it. Mary – Thanks! :) I’m actually pretty new to cardamom (what?? ), and am trying to make up for lost time. Kylie – I definitely need to work on pie crusts, and haven’t ventured into the world of biscuits! I’m sure you’ll conquer them sooner than later. :) I’ve used lemon juice in apple crisp, and it’s awesome! NYC Girl – Thanks! My roommate thought I was baking cinnamon rolls! 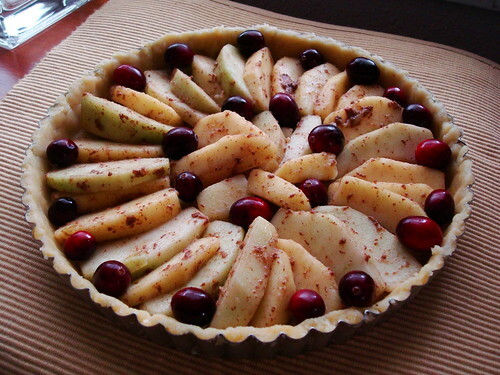 Jill – I’ve decided that I like arranging fruit in tarts because it makes me feel fancy. A challenge very well done! Delicious first challenge! 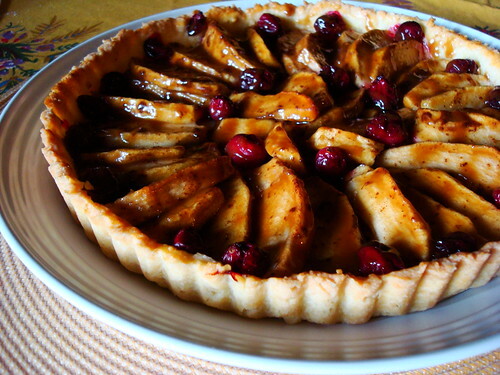 Now I’m craving apple tarts! :) Welcome to the DBs!! Thanks for your lovely comment on my Crostate. I’m not surprised your crostata went quickly! It looks beautiful and sounds delicious. I’d be very happy to curl up with a bowl (or bowls) of that right now. Welcome to the DBs! I’m excited about next month’s challenge too. Hey, very cool, and very pretty! I think I will definitely check out these Daring Bakers, how exciting! You should! Some of the past challenges make me scurred! Fantastic job! Welcome to the Daring Bakers; I’d say you started with a bang! Great first challenge! Apple cranberries sounds like a perfect filling for this time of year! Wow your crostata looks beautiful! Welcome to the Daring Bakers, I hope it brings you as much joy as it’s bought me. Can’t wait to see what the next challenge is. But in the short term I might give your Zebra Bundt Cake a try. I feel like I’m learning a lot already, plus it’s fun! Let me know if you do try the zebra bundt. I almost didn’t want to bake it because the batter was so pretty! Great job on your first challenge. Welcome to the DB’s!!! Great job with your first DB’s challenge. A very nice combination of ingredients. Pingback: No-Knead, Overnight Dinner Rolls | bake me away! Pingback: Daring Bakers’ Challenge: Biscuit Joconde Imprime/Entremet | bake me away! 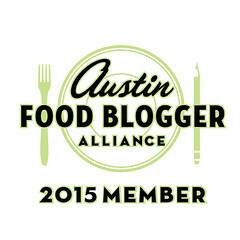 Pingback: Thanksgiving Procrastinators Anonymous | bake me away! Pingback: Thanksgiving Dessert Pondering | bake me away!